The Digital Marketing Benefits of WordPress - Wood Street, Inc.
Clients keep asking us if they should use WordPress as their content management system or CMS. Ultimately, it depends on the goals of the site and what functionality is needed to support those goals. That said, for most businesses and organizations we encounter, WordPress is the best CMS. WordPress functionality can be extended to fit most of our client’s website needs. There is also a vast developer community out there building plugins for WordPress for just about anything you can imagine. Content marketing is a proven digital marketing strategy. Organizations produce content their audience can use and adds it to their website or blog. Then, this content gets promoted through social, email, paid channels and more to reach the target audience. Marketers can use targeted keywords and phrases in the content to drive search engine visibility. And this useful content on your website is valuable to your target audience. This value helps to build backlinks – links back to the website – through social shares and other mentions. WordPress is an ideal CMS for content marketing. It started as a blogging tool so content marketing is in its blood. It has been refined over the years to make it one of the easiest utilities for creating and editing website content. While not a full fledged Association Management System like iMIS, WordPress has a wide variety of plugins available (including an iMIS plugin) that can help you manage most membership needs. You can easily manage your members, offer payment and scheduling options for events, sell merchandise, and much more. Associations and nonprofits as well as small to medium sized businesses can use WordPress to create a community of brand evangelists. With these plugins and a solid digital marketing strategy, organizations can turn their website into a portal where their community of members, clients, etc. can gain access to information. WordPress functionality can also be extended and customized to do just about anything you need. So, you don’t need to settle for “off the shelf,” you can make your website a custom resource dedicated to the specific needs of your audience. This is called Utility Marketing. With the functionality and strategies mentioned above, you have a powerful Youtility tool as Jay Baer puts it. Your website will be the hub of a community of clients, members, whoever your target audience might be. 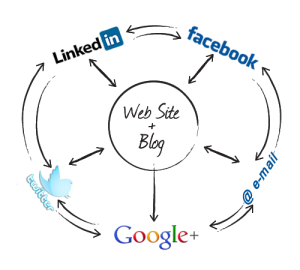 From this hub you can build the marketing wagon wheel (see below) where social channels are the spokes. The wheel is completed as your community starts sharing and discussing the content, events, merchandise that lives on your website – the wheel hub. The channels in the outer ring might change over time but the hub stays the same. Using a plugin like Yoast, you can easily test the SEO strength of a page or customize the page title and META description. WordPress eliminates any content bottlenecks which means content will be updated more often. This will improve rankings. WordPress allows you to expand the pool of content editors in house. This is an extension of point 2. These editors, if invested in the success of the organization, are empowered to make changes on a regular basis which improves the SEO of the site. Conversion – turning visits into leads/sales – is easier with a CMS. You can track which content gets visits, shares, or comments and which do not. Then, tweak or eliminate the bad content and expand on the good content. You can also track which calls to action work and which do not. With WordPress, you can try a variety of offers and calls to action. So, after identifying an offer/call to action isn’t working, you can replace it with something different that could produce better results. Your website design/development firm can setup callouts and calls to action like buttons, styled boxes and more. And using a plugin like Advanced Custom Fields, the developer can set these up to be easily editable. There are plenty of CMS options out there. I suggest that before making a decision, you do your research. Cost – because WordPress is open source, there is no license. A proprietary system usually has a monthly or yearly fee. Also, the pool of available WordPress developers is vast. Competition means competitive pricing. Of course, price isn’t everything. A large group of available developers also means you won’t be left stranded if your developer goes AWOL. Portability – Because WordPress is built on a widely supported platform of PHP and MySQL, and it’s open source, it can be hosted just about anywhere. And because it’s not tied to any package or proprietary system, you’re not stuck in some agreement you can’t get out of. Flexibility – There are so many plugins for WordPress that you can find one for just about any sort of functionality you need. And any custom functionality not supported by a plugin can usually be developed by the many quality PHP developers out there. Longevity – With many CMS’s, an upgrade to the latest version is a major headache. With WordPress, it’s usually a day at most and sometimes just a flip of the switch. I would always recommend checking with your developer before doing an update. I’ve given you a good bit to chew on here. In 2017, agility continues to be super important. Agile marketing means that your team is able to market on their time… not within the schedule of one staff member or your design/development firm. The time between idea and implementation can sometimes be a matter of minutes with agile marketing. 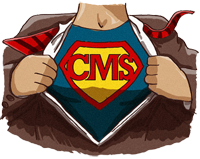 This makes the CMS your content superhero. You can discuss content marketing initiatives and then implement them right away. If you lag at all, you could possibly lose out to your competition. Assume they all have a great CMS, because chances are a lot of them do. What are your thoughts on WordPress?